I mentioned the Linux spectrum analyzer Baudline in my last post. I like this tool and have used it professionally as well as with my amateur radio activities. Recently, I acquired an Asus Eee mini-laptop for work. If you have not seen these PCs, they are inexpensive small laptops with a 7″ screen that run a form of Linux (a modified form of Xandros to be specific). The package is very portable with a 4Gb solid state hard drive, 1Gb RAM, WiFi 802.11 b/g, inbuilt camera and soundcard. Bigger than a Palm personal organizer, but still very portable and arguably more flexible. Alternatively, open the file manger, move to the directory of the extracted files and double-click on the file “baudline” . Baudline should run and you will see the split screen view of the spectrum waterfall (above) and the spectrum (below). Right click on either of these windows to get the menu options. This application is powerful in its capabilities and I recommend you read the manual on the baudline website. If you have nothing connected into the mic input, then baudline defaults to the inbuilt microphone. My daughter found it fun to watch the screen as I whistled at the Eee with a sweeping pitch. 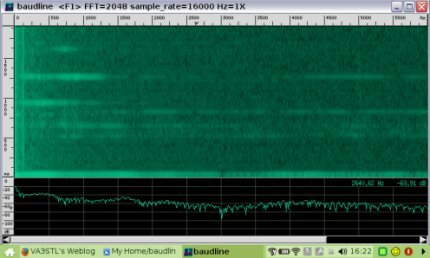 So, your little Asus Eee can easily be a portable spectrum analyzer for audio frequencies. Thank you for the nice comments. I am glad you liked the post. Neat little utility. Reminds me Audacity. However, I was hoping to find a radio frequency spectrum analyzer. …more searching to do…. Glad to see a Linux enthusiast experimenting in this.